Deciding where to sell your products can be a tricky process. Options include selling at community markets, online via Etsy or Facebook, or inside retail shops. Where to sell will depend on your personality, skills, budget and the time you have available. With so many options, choosing the right outlet can have a huge effect on the success of your business. Because of this, it’s important to thoroughly research each market before making a decision. It’s also important to remember that you can sell your products more than one way! One of the most popular selling options is via the internet. Selling products online is a great way to reach a large customer base beyond the local community. It can also be cost effective, because you don’t need to invest in items such as display shelving or a booth. When selling online, the two most popular options for those just starting out are Etsy and Ebay. If you have business page on Facebook, there are also apps and plugins to create a page that customers can shop from. 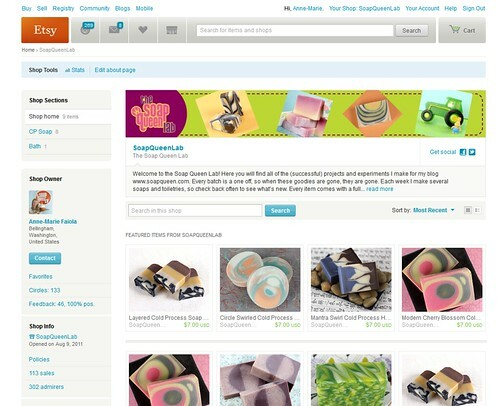 Both Etsy and Ebay allow the user to create an online shop, which features different pages for each product. These product pages include photos of the product and information including ingredients and pricing. This format allows the customer to learn information regarding each product easily and quickly. When selling in person, it can be difficult to present as much information in such an organized way. The down side to selling products online is that customers are not able to touch, feel and smell the merchandise. Because customers can not see the product in person, it’s important to have quality, clear images that really pop. If you’re looking for tips on how to photograph your products, check out this blog post. Another factor to consider with selling merchandise online is product needs to be packaged and shipped. For some consumers, shipping costs make or break a sale. With the popularity of free shipping from large companies, many customers will not purchase items unless shipping is free or extremely cheap. Since there is really no such thing as “free” shipping you must consider how you will cover the costs of shipping. Most businesses increase the price of the product to cover the expense of shipping and packaging. For more information regarding selling merchandise online and social media tips, check out the blog posts below! Remember, a lot of the social media tips are helpful even if you choose to not sell your items online. Pros: Opportunity to sell beyond the local community, ease of use for customers, social media means free advertising, no physical display costs (booths, shelving, etc). Cons: Customers not able to see products in person before purchasing, must factor in packaging costs and shipping prices, building relationships with customers can become more difficult. Craft fairs and farmers markets are a great way to sell products to the local community. Being able to talk to customers in person is invaluable; questions and concerns can be answered on the spot and personal connections can be made. Many consumers find products made locally to be more valuable, and meeting the person who made the amazing handmade beauty product also enhances the value. Not to mention, selling in person gives the opportunity to talk up your products! Customers are also able to feel the product in hand, and possibly sample the product. The Daily Scrub’s eye catching craft fair display. 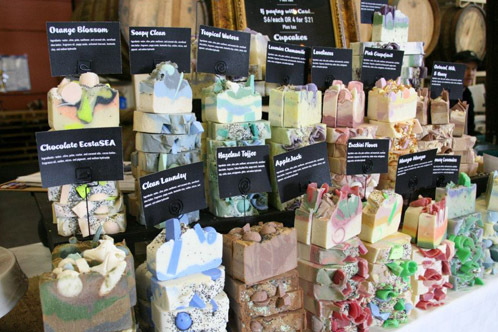 Selling at a craft fair or farmers market allows customers to touch and smell product. In addition to connecting with customers, selling at a market or fair presents the opportunity to meet other small business owners. Building relationships with small businesses in your area is incredibly valuable. Doing so is a great way to learn from others and find new marketing opportunities. Small business owners are passionate about local business, and are often each other’s biggest support system. While selling directly to the customer in person has many benefits, it’s not for everybody. If talking to a lot of strangers sounds overwhelming, selling online or in a retail store may be a better option. Time is also a crucial factor; selling products at a craft fair is an all day commitment. Between setting up the booth, selling the products and taking down the booth, craft fairs and farmers markets take a lot of time! If you do not have the time to commit to a fair or market, it may not be an option. Pros: Customers able to touch and feel products before purchasing, building connections with customers becomes easier, no shipping costs, build relationships with fellow entrepreneurs and local businesses. Cons: Requires display items (shelving, labels, etc), can be intimidating/stressful for introverts, requires a lot of time (preparation, setting up booth, selling, taking down booth), unable to reach customers beyond local community. 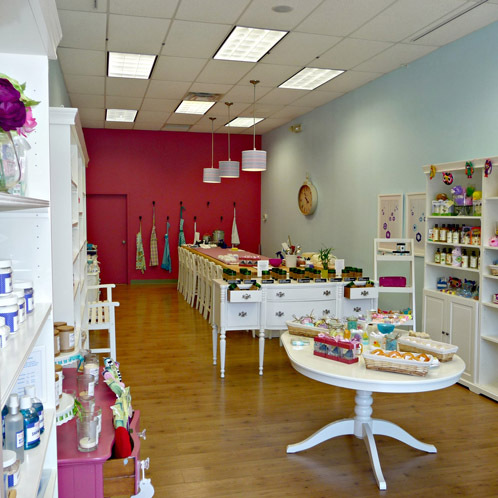 For some, selling products in a retail space is a possibility. This may be in a retail space of your own, or selling products inside an already established store. Selling products in a retail space of your own usually requires an established customer base to thrive. Many soapers who open a retail space start with selling at fairs or online to find and keep loyal customers. A great example of this is Josie of Josie’s Beauty Boutique. To read more about Josie’s selling experience, click here. For businesses who are not yet ready to open their own space, selling products inside an established retail space is a fantastic option. Inside Kensico Soap Bar’s beautiful store. Read the interview with Kensico Soap Bar here. When identifying possible retail spaces to sell your products, it’s important to first do your research. Find a store that has a similar aesthetic to your products. Doing so ensures the customers who already enjoy the items inside the store will also be attracted to your merchandise. Next, find out more about the company. Some questions to ask: How long have they been open? Do they have multiple locations? Do they already sell similar items? What is their social media and advertising presence like? It’s important to consider factors that will help your products sell (loyal customers, multiple locations, strong social media presence), but it’s also important to consider how your products will help the store. Remember, this selling situation is a partnership. Once you have identified a store that you want to work with, it’s time to approach them for the sale. Learn more about this process in the Writing an Introduction Letter to Buyers: Ask for the Sale blog post. Selling your products in an established retail store means they are doing half the work for you – advertising, selling, displaying, etc. On the flip side, you may not have as much control on where and how your products are merchandised. The salesperson in the store may not be educated about your products, and may not be able to speak to their amazing qualities. One of the major cons of selling in a retail space is that this format requires wholesale pricing, which is typically 50% of retail pricing. When starting out, many crafters forget to factor in all of the costs of doing business and price their products too low. You may not be able to afford a 50% discount when you are first starting out, but cutting your costs and making your process as efficient as possible is always a good thing to strive for to reach that price point. Gettin’ On My SoapBox – Sell, Sell, Sell! Pros: Less time spent selling means you have more time to make products, tap into already established customer base. Cons: Wholesale pricing, give up control of merchandising, not able to represent your product yourself. 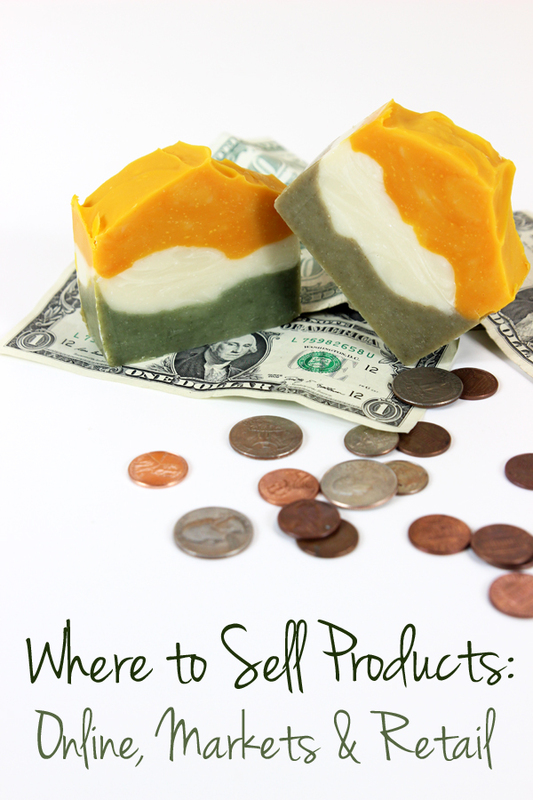 If you own a soapy business, how do you sell your items? I would love to hear about your selling experiences, and why you sell the way you do! Where do I find out about regulations on contents of my products when selling to public . First off great article! There is some great information. I do have a question though. What about liability insurance? Is this an issue? Does anyone have it and if so from where? I would think if one was going to sell their products, especially on line, one would need insurance. I am just not sure how to go about it. So glad you like the article! As for insurance, you want to protect yourself from losses related to being in business. The Handcrafted Soap Makers Guild and the Indie Beauty Network both offer insurance for members. The company you use for homeowners or renters insurance may also offer coverage. Thank you for this info. I just had this conversation with a family member last night about Etsy, and Facebook. I have done fairs, but it is a lot of work. Also, being retired, I would like to have flexibility with time to do other things. This article helped to answer questions I’ve had, especially with the links you provided. Thanks again. Barbara – It’s a good thing to talk about with others. I know I find a lot of value chatting about strategy with friends, family and fellow Brambleberrians. What sounds good in my head doesn’t always work in practice when I try to explain it =) Have a fantastic 2015! It’s so funny that you mention that, Carlos. There’s a name for building your business on the back of another business; it’s ‘digital sharecropping’ and it is a real concern, especially for companies building themselves on Facebook (who has shown a propensity for switching policies quickly with little to no input from users). Having your own shop is ideal but then it’s difficult to get traffic (and this is where Etsy, Garmentory and Ebay shine and make it easier and more automated for small shop owners). It’s a balance and the ‘answer’ for each business will be different. Thank you for reading – and commenting! In regards to selling online (like Etsy, for instance) I’ve always been concerned about products melting or getting damaged in shipping. I primarily like to make m&p soaps because the options are so unlimited (embeds, water soluble paper, etc) but wonder if it wouldn’t melt when being shipped. This is really the only thing preventing me from selling via Etsy. Just curious! Hi Sarah – That’s a great question! And really, the only way you’ll know the answer is by shipping boxes out to friends in various states and shipping them back to yourself – in those very very hot months. But to answer your question based on what I’ve seen: we ship a lot of melt and pour during the very hot months. There is rarely any melting – and if there is, it’s because a box has sat in direct sunlight for hours and hours. Body Butters have a much lower melt point and are something that some soapers/crafters choose not to sell during the summer months but most ship Melt and Pour soap all year round without much hassle. There’s always the other 10 months to rock out your Etsy or online shop =) I can’t wait to hear how you do. I sell very little online. I had an Etsy shop, and over the period of a year, I had only 6 sales. It was very disheartening. My sales on my own website are only mediocre, although I get plenty of views–at least 10 times more views than I had on Etsy. I tried farmer’s markets, festivals, and flea markets, but my sales were hit or miss most of the time. Most farmer’s markets and festivals have at least 3 other soap makers, who sell their products for pennies, and I can’t (and won’t) compete with that. I usually made enough to cover my booth fees, but there were a few occasions that I lost as much in theft as I made in sales. Then there’s the weather with outdoor events. Once, I lost almost half of my melt and pour stock from melting in the hot weather (it was projected to be cool that particular early April weekend, but so much for that!). With all this said, I do very well in wholesale. 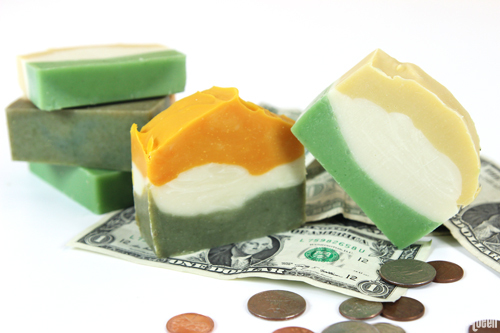 Since I do custom orders, I can tailor my soaps to my customers’ needs, which also suits their clientele, and I’m usually successful in getting them to buy other soaps of mine that were not custom orders. And they continue to reorder often. My wholesale customers are the only ones keeping me afloat. I’m interested in finding out how may others here also do wholesale over retail. Hi Janita – I don’t know what your Etsy shop was but I would be curious about the photography, descriptions and lay out. While Etsy does really do a fantastic job about education and bringing in solid traffic, it is very much a situation of you needing to promote your Etsy site (mailing lists, email, coupons, follow-up after the sale) similar to how you’d promote your own website. However, unlike your own website, it’s extremely easy to set up so there’s some real advantages to use Etsy. I’m so glad that you found a niche in wholesale. Sometimes it’s good to just focus on one thing and really blow that one area out and let the other things go =) Which, it sounds like you are! Congrats on finding your sweet spot for business.